Amp repairs seem to go in waves. The latest one being a string of TSL with what I call TSLitis. This increasingly common condition causes these amps to overheat and do serious damage the amp. 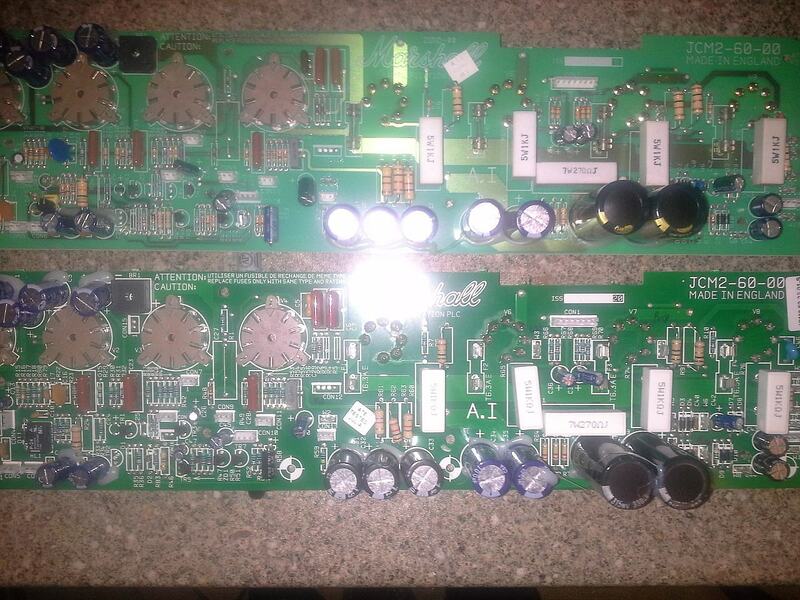 The problem is that the amps circuit board material is not doing its job of insulating the connections properly and what happens is that valves bias drifts which in turn drives the valves harder overheating the valves which causes destructive feedback loop. All of this places a strain on the power supply, valves and supporting circuitry; all of the most expensive components in an amplifier. The ones I have seen seem to be from around 2000 to 2002 and are quite easily identified. Discolouration of the valve bases due to overheating. This is usually visible only on the reddish brown bases where they go distinctly dark brown as they meet the glass envelope. Red plating of the power tubes (that is the flat grey piece of metal you can see inside the glass envelope). It is supposed to be grey but when over heated turns a “cherry” red colour. Amp transformer failure if left on for a prolonged period. Valve overheating – evidence on the base. Top good. Lower overheated.